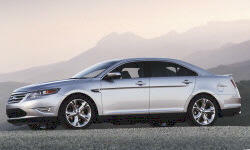 Ford Taurus Pros and Cons | Page 1 of 3 | Why Not This Car? What drives people to buy (or not buy) a certain car? TrueDelta's members share Ford Taurus pros and cons based on their real-world driving experiences. Winter Update: I LOVE my Taurus in winter too! I considered a Buick but the trunk space was too small. rnI considered a Chevy but their technology at that time was not nearly up to Ford standards. rnThe Ford just looked better. rnThe Taurus was made by Ford and was not an import. Great little car for around town driving. Great car for commuting less than 30 miles each way. The Taurus has traction control and 6 airbags. It rates very high in crash tests and rated very stable by our insurance company. A close relative who is a paramedic stated the car can take a horrible wreck and the people in be in pretty good shape. DOHC 24V V6 is reliable, low maintenance, and with adequate power for my SE wagon. Bold lines, distinctive. Has the look of a high quality Euro-sedan. Stylish, easy to enter and exit. Body has streamline look. other than the trunk release on the dash the interior surrounds you the seating is very comfortable..multi contour air cond heated seats the adjustable pedals are great. Most color choices, or at least in my case, are earthy tones, nothing really that stands out.